Promoting the exhibition of short film. 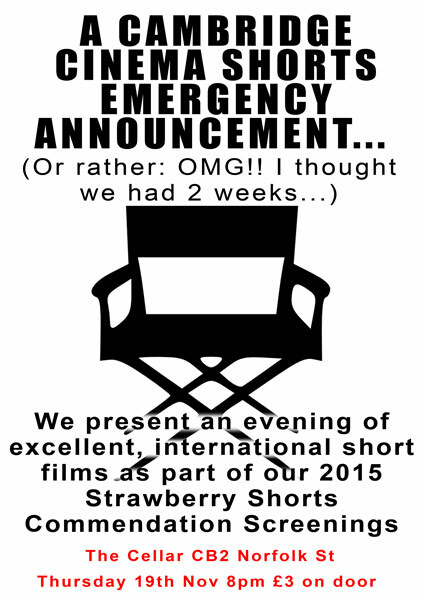 Cinema Shorts presents … an evening of excellent, international short films, presented as part of our program of Strawberry Shorts 2015 Commendation screenings. Films from around the globe. Glances into lives unimagined. This is the territory of the short film. Sit back in the comfort and conviviality of CB2’s excellent cellar and let us entertain you. Also, we do apologies for the short notice, (not a pun), but, well, at least you have less time to forget about it. Keep up to data with Cambridge Cinema Shorts events and don't miss out on the fun by joining our mailing list. Your email address will not be passed on to a third party. It will only be used to communicate the events and activities of Cambridge Cinema Shorts to you.